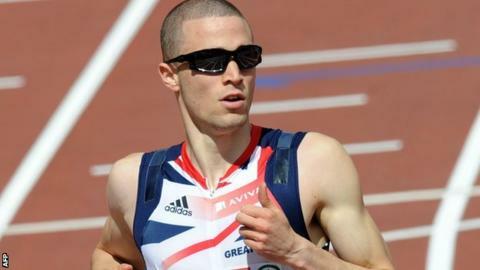 British sprinter Danny Talbot won bronze in the 200m at the European Championships in Finland. Talbot finished behind race-winner Churandy Martina and Patrick van Luijk, both from the Netherlands, in 20.95s. Talbot, 21, told BBC Sport: "I can't quite believe it. To come here and get a bronze is a great feeling. In the wet Helsinki weather, British discus record holder Lawrence Okoye could only manage a best of 60.90m to finish in 12th place. Okoye has already met the stipulations of automatic qualification for the London Olympics and told BBC Sport: "Obviously I'm disappointed. I didn't cope with the conditions. I deserved to come 12th. "I just need to go home and train and come back stronger. "I've got to learn to cope with the conditions. If it rains, it rains. I didn't deal with it today. Today mattered, I didn't do my job and I'm disappointed." German world champion Robert Harting took the European discus title with a fourth-round effort of 68.30m. Bronze for sprinter Talbot marks his first podium finish in a major senior international competition. He said: "I'm really proud to be able to do that for Great Britain. I thought I could get on the podium but it's always more hope than expectation. "I came here to get the 'A' standard but unfortunately I didn't. Hopefully I've done enough (to be selected)." Fellow Briton Chris Clarke finished in 21.26s. BBC commentator Brendan Foster said: "Danny Talbot ran a great race. The two Britons got away to a cracking start. Talbot was leading the field until the last 20m but then Martina began to eat up the ground." Talbot has one Olympic 'A' standard to his name, achieved last year, but as he didn't finish in the top two at the trials GB Trials he must await a decision from UK Athletics selectors as to whether he will compete at the London Olympics. After the disappointment of the women's British women's 4x100m relay team being disqualified, the men's team fared better as Christian Malcolm, Dwain Chambers, James Ellington and Mark Lewis-Francis qualified fastest for their Sunday final in Helsinki with a time of 38.98s. In the 4x400m relay, Britain's men team of Nigel Levine, Conrad Williams, Michael Bingham and Luke Lennon Ford won comfortably in 3:05.50, ahead of Poland, to make Sunday's final. Eilidh Child, Kelly Massey, Nicola Sanders and Shana Cox finished runners-up in their semi-final of the women's 4x400m relay (3:29.96) behind France who won in 3:29.03. Elsewhere on Saturday, William Sharman and Gianni Frankis advanced to the semi-finals of the 110m hurdles as Richard Alleyne missed out, while Jade Nicholls (51.75m) failed to make the women's discus final and Charlene Thomas was disqualified from the 1500m for stepping off the track. 10,00m runner Keith Gerrard finished ninth in the final with 28:57.97. Tom Lancashire also failed to progress in the men's 1500m, while Andrew Sutcliffe, Max Eaves and Luke Cutts all missed out on the pole vault final.